This cake will be delivered in a sturdy cardboard box. This cake will be garnished on top with fresh cream, chocolate shavings and cherries on top. The designing using all the toppings may vary a little from the image shown. The cake you love the most is here in most delectable taste to delight everyone. 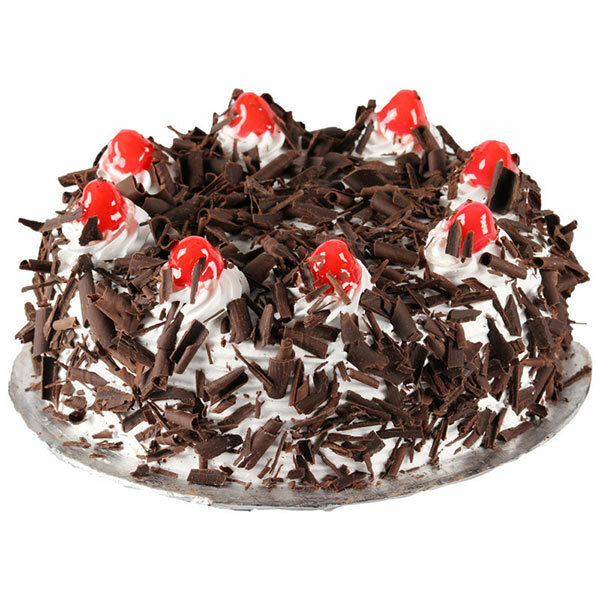 This 1/2 kg Black Forest Cake that we are offering to you is baked to perfection and is designed with wonderful decoration. Tops with cherries and chocolate flakes, this cake is sure to delight everyone in one bite. You can find it perfect for birthday, farewell and other special celebratory moments of the year. Apart from the bread base and creamy topping the key ingredients of this cake are flour, powdered sugar, baking powder, eggs, chocolate shavings, cherries and more. You can also opt for eggless version of this cake and enjoy celebrations and festivities. Gifting to wife, parents, bhaiya bhabhi, and others on wedding anniversaries. Surprising our dear ones on special celebrations like Mother’s Day, Father’s Day, Valentine’s Day, and Women’s Day. Festive occasions like Christmas, New Year, etc. Our offered cakes are baked to perfection by expert bakers. However, there can be slight difference in the final product as every chef has a distinctive style of baking and in designing a cake. Considering the perishable nature of cakes, the delivery attempt is only conducted once. Therefore, the ordered cake delivery to a specific address cannot be redirected to any other address. The selected delivery date and time is an approximation which depends on the delivery destination as well as on the availability of the cake. Cakes are hand delivered to the specified location as it can’t be delivered with other courier products. In rare moments little variation or substitution in the designs and flavours of cake happens due to any sort of regional or temporary unavailability. For longer shelf life of cream cake, please store cream cakes in the refrigerator. The cakes baked with fondant must be stored in air conditioned setting. Always make us of only serrated knife for cutting a fondant cake. Cute and serve cake to loved ones only at room temperature. Never let cake be exposed to heart. Be careful while consuming sculptural figurines or other elements of the cake as there may be wire support, wooden skewers or toothpicks used for supporting it on the cake. Always be cautious about cake’s placement before serving it to little kids. Make sure to consume the cake within 24 hours of delivery. Have a delightful Cake relishing moment! !